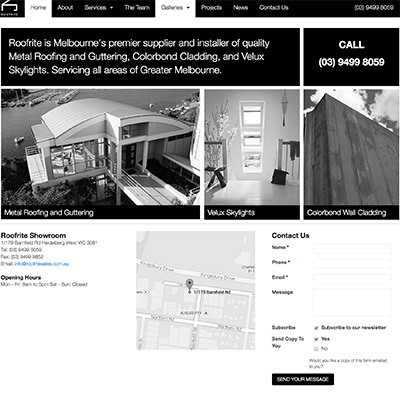 Roofrite is a supplier and installer of quality Metal Roofing and Guttering, Colorbond Cladding, and Velux Skylights. Or, simply put, Licensed Master Roof Plumbers. When we first met, Roofrite's website was largely controlled by an organisation that listed their site as a subdomain of theirs. They had little or no control over the site, or the content. Looking to grow their business they needed to be masters of their own destiny. They had a clear understanding of their market, but need guidance to help them increase the business coming via their site. If you think purely in terms of roof plumbers, the field is enormous! But we had a plan, a strategy to help them stand out from the pack. We've been working together for quite a while now, and a majority of their business comes via their site. Firstly, we built a website, giving them back control over their domains, website, and the ability to manage their content. Then we started to focus on key areas of their business. Rather than trying to be the number 1 ranked roof plumber, we aimed to make them prominent in key areas of their business that were both profitable and achievable. This is key. It has to be achievable, and it has to be something that can be maintained over the long term. From there we have chipped away at every one of their service offerings and increased their search engine exposure in all aspects of their business. 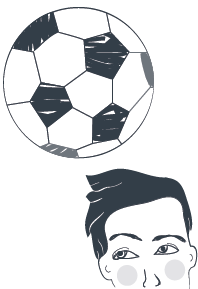 We've added regular email marketing to the mix, reaching out to their client base. The result have been amazing! We continue to work on content, site development and building the business. As any business owner knows, markets constantly change, and a business needs to move with it. Until now our focus has been the website and email marketing, but we are starting move into social media. The key, as always, is a consistent and constant approach to quality content while measuring the results.